I&apos;m nervous. Like super nervous. There was something I have been meaning to tell Dylan before he meets my family and now is my only chance of telling him before my family ruins it. "Hey, Dyl," I say as he drives our rental car from the airport to my old neighborhood where I grew up. "There&apos;s something I&apos;ve been meaning to tell you." I finish setting our coordinates on the GPS and look at him. He glances back at me for a second smiling not wanting to take his eyes off the road for too long. "What is it, babe?" He asks. I look at the window not wanting to respond. I know we still have an hour to drive until we get to my house. I could wait a little bit longer. After a minute of no response Dylan looks at me again with a curious glance this time. "Babe?" He asks again. "Okay," I say finally growing the courage. "I&apos;m going to tell you this but you can&apos;t think that I&apos;m weird. Promise?" I ask. "Promise," he says lifting up his pinky. We pinky promise and I take a deep breath. "Okay," I start slowly. "When I was like, 14 maybe, I used to... Have like... A little crush on you." He starts to giggle. "But not in an obsessive way or anything, I just had a pillow case with your face on it and I had pictures of you on my wall," I joke. 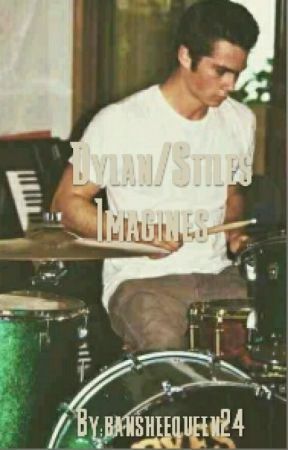 "Oh my God," Dylan manages to say through his laughter. "Don&apos;t think I&apos;m weird." I say again. "I don&apos;t think you&apos;re weird, Y/N," he says taking my hand. I sigh in relief. "I think it&apos;s cute actually." "Really?" I ask. "You don&apos;t think it&apos;s weird that I used to tell all of my friends that I was going to marry you and you didn&apos;t even know who I was?" I&apos;m digging myself a deeper hole. He laughs again and kisses the back of my hand. "It&apos;s a little weird but I would do the same to you if the roles were reversed." A smile grew across my face. "Heck, I do that now. I swoon over you and tell my friends I want to marry you all the time." My smiles grows bigger as I bite my lip. I lean back in my seat and take another deep breath. "Gosh," I say. "I&apos;m glad that went well." He laughs again and looks at me. "You were right," he says smiling his big goofy smile, his brown eyes sparkling. "I was right about what?" I asked him. "You are going to marry me." He kisses my hand again and plays with the engagement ring I have around my finger. That&apos;s the reason why we are even coming here in the first place. "A pillow case?" Dylan asks. "Really?" I laugh as we ride the rest of the way to the place I call home. "We&apos;re here!" Dylan screams as we pull into the driveway of my old house. When he parks, we both look at each other and smile. "I love you," I tell him. "I love you too," he says. Then I see my mother run out of the house with her arms up in the air. "Y/N!" She screams. I step out of the car following Dylan. "Hey mom," I say running up and hugging her. When she pulls away she looks over my shoulder at Dylan. "Dylan!" She screams as she runs up to him to give him a hug. "Hey," he replies returning the hug. "You all have to come inside. The whole family is here." Mom says as she turns to head back inside to tell the others of our arrival. Dylan walks up behind me and gives me a hug around the waist. He plants a sloppy,wet on my cheek and takes my hand as I lead him inside. After I introduced Dylan to my family, we got our bags out of the car and brought them up to my room. "Well," I say taking the first step into the room I hadn&apos;t been in since my graduation. "This is it." "Ahhh," he sighs putting the bags on the floor. "So this is where the magnificent Y/F/N Y/L/N grew up." I laughed as he sat down at my desk and spun around in the chair. "Yeah," I said sitting on my bed. "I haven&apos;t been in here in years." Dylan walked over to me and grabbed my hands making me stand up. "Are you ready to tell your family you&apos;re gonna be an O&apos;Brien?" Dylan asks with a big, dopey smile on his face that lit up his eyes. "Of course." He leaned down and kissed me, grabbing my waist. I held on to his neck and stood on my tiptoes to try and make the kiss last longer. "God, I love you." He said after pulling away and looking into my eyes. Hope this was a good one you guys! It is short but I will make up for it! I think I am going to start an actual book but I don&apos;t know what I am going to call it. I&apos;ll keep you guys posted. Thanks for reading, commenting, and voting! Love you!